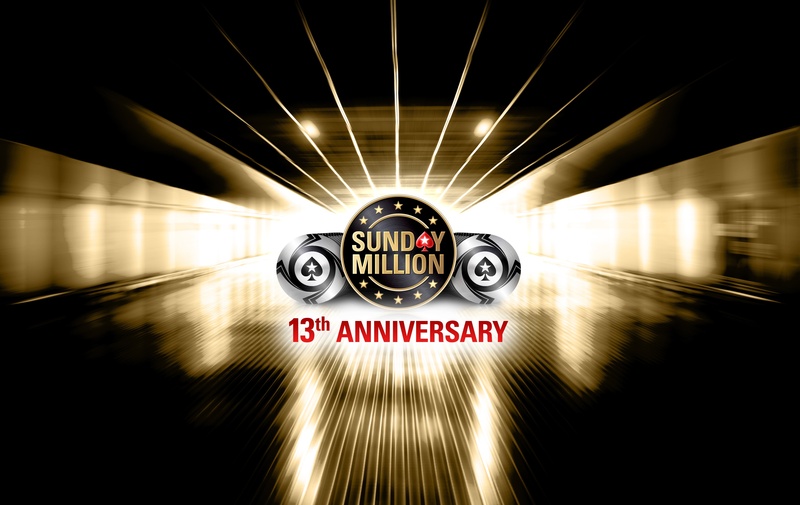 In just about every conceivable way, the Sunday Million 13th Anniversary was enormous. Two days of online poker. More than 61,000 players from around the world. Twelve million dollars distributed among the top 10,000 finishers. And for five players from Europe and Asia who outlasted the field to strike a deal among themselves, a six-figure score that will forever associate them with this historic anniversary. Day 1 wrapped up after 35 levels of play, giving the 980 remaining players the night off before returning at 1 p.m. ET today to play down to a champion. That task would take a total of eight hours and 19 minutes, and at the end of it all a player from China by the name “wangli0402” would take top honors. From the very beginning the Day 2 action was brisk, and past performance was not an indicator of future results. Lex Veldhuis came back with a few big blinds and stretched them as far they would go, finishing in 741st place for $1,345. Two-time Milly champ RobTinnion made a little further to 685th place and earned the same payout as Veldhuis. Even overnight chip leader Deputado1414 of Brazil was only able to last until 141st place ($3,920). As the day’s sixth break approached, the bubble burst. The U.K.’s patpef open-jammed for 49.8 million chips with K♦Q♣ and ended up heads-up with kacer148’s A♠J♠. patpef was drawing dead after the flop came A♥A♦9♠ and finished in 10th place for $44,367. The first knockout came early on in a standard race. Georgia’s ZoMbiE2808 jammed for 62.3 million over the top of xbambi’s 12 million opener, only to see RMarland successfully isolate from the big blind. The latter’s J♣J♥ held up against the former’s A♠K♥ and ZoMbiE2808 was gone in ninth. 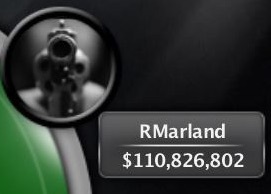 That win turned out only to be a stay of execution for RMarland. Two orbits later the player from the U.K. opened in the hijack seat with 8♦8♠ for 84 million chips, leaving 5.2 million behind, and picked up a call from idzake on the button. idzake called and showed J♥J♦ when RMarland moved in on the 4♣2♣Q♦ flop. RMarland needed a two-outer but didn’t find it on the turn or river and left the tournament in eighth. idzake and t4rz4n_21 tangled a couple of times over the next 10 minutes and shipped a few hundred million chips back and forth in the process, but it was sega1989 whose tournament would next come to its conclusion. The Russian player opened for 48 million chips under the gun with A♠J♠, leaving 28.7 million behind, and then called those off when wangli0402 re-shoved for 97 million in the cutoff seat. wangli0402’s A♣K♦ had the pre-flop edge and nothing changed when the board fell 10♥7♦3♦3♠8♦, sending sega1989 to the rail in seventh. A second final table KO for idzake would shrink the lineup again after another two trips around the table. 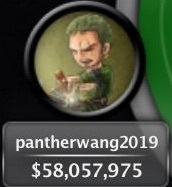 All the chips went in before the flop, with idzake min-raising 3♥3♠ to 20 million, pantherwang2019 jamming for 74 million with K♠Q♠, and idzake calling. idzake jumped out front with bottom set on the K♦Q♥3♣ flop and dodged the remaining kings and queens in the deck on the turn and river, showing pantherwang2019 the door in sixth. The five remaining players were all guaranteed $250,991 at this point. After t4rz4n_21 doubled through idzake with K♠K♣ against J♣J♥ to take over the lead and even out the stacks a bit, they decided to forgo the shot at a million dollars and strike a deal to lock up major money for everyone. As soon as the moderator presented the numbers, everybody typed the magic words — “I agree” — and the new minimum payout at the table was $509,000. With two days of poker in the rear-view and just $50,000 left to play for, the action moved quickly. 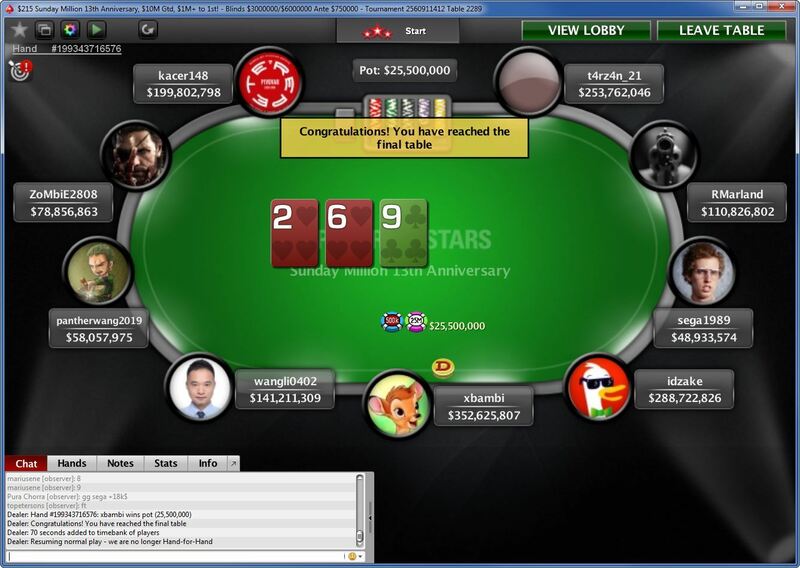 t4rz4n_21, who as chip leader had already locked up the largest share of the deal, pushed the action. But it was wangli0402 who ended up taking charge of the proceedings. wangli0402 min-raised to 20 million under the gun and t4rz4n_21 flat-called on the button to bring the 8♣6♣K♦ flop. wangli0402 check-called 30 million there and another half-pot bet of 60 million on the 2♦ turn, before leading out for 120 million — more than half his remaining stack — on the 8♥ river. t4rz4n_21 raised to put wangli0402 all-in and showed J♥Q♦ for kings and eights when the Chinese player called. But wangli0402’s trip eights with A♠8♠ took down the 662-million-chip pot to claim a significant chip lead. Five hands later t4rz4n_21 open-shoved for 78.9 million (just under seven big blinds) with K♥2♥ on the button. idzake isolated in the small blind with A♥9♥, but t4rz4n doubled up with a pair of deuces on the Q♥2♦7♦Q♠6♥ board. t4rz4n_21 open-shoved again on the next hand, this time for 175 million with K♠10♦, and wangli0402 called with 7♥6♥. That went from slight pre-flop underdog to a pair of sixes with a flush draw on the 4♥6♣Q♥ flop, to two pair on the 7♠ turn, to a flush on the J♥ river. King-high didn’t cut it and t4rz4n_21 swung free in fifth. wangli0402 struck again three hands later. After limping in for 12 million under the gun with K♠9♠, the Chinese player called when kacer148 shoved for 177 million on the button with A♦3♣. The board ran out 8♣7♦K♥3♠K♦, giving wangli0402 trip kings and ending kacer148’s tournament in fourth. wangli0402 took another swing on the next hand and jammed with 9♣8♦ in the big blind after xbambi limped in from the small blind. It was a trap, though, and xbambi’s A♠K♥ made top pair on the flop to double to 541 million chips. But wangli0402 got it all back five hands later after raising with A♥A♠ on the button. idzake jammed with K♦Q♥ and got no help from the board, exiting in third. That win gave wangli0402 the edge with 973 million chips to xbambi’s 559 million as heads-up play began. The duel would only last three hands. xbambi opened the betting with a min-raise to 24 million on the button. 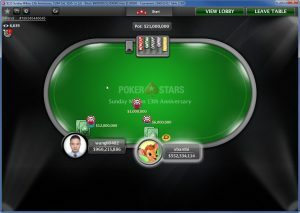 wangli0402 called and checked the 5♥10♣4♦ flop, then raised xbambi’s 16.8-million-chip bet to 45.6 million. xbambi three-bet to 108 million and then snap-called when wangli0402 moved all-in. xbambi had the edge with A♣A♥, while wangli0402 had an open-ended straight draw with 7♣6♠. That draw came home on the 3♦ turn and brought this truly massive tournament to a close. It’s quite an achievement to outlast a field as large as the one that turned out for this tournament. Congratulations to all our finalists, especially our champion, wangli0402, and the other four dealmakers!